Reformers William Tyndale, John Calvin, Martin Luther, Ulrich Zwingli, Philip Melanchton, among others taught that 70th Week of Daniel is fulfilled by the sacrifice of the Blood of Jesus Christ and has nothing to do with the end time to come. However, after the Protestant Reformation the jesuits came with a counter reformation and introducing the deceptive Pre-trib Rapture and the myth of the 70th Week in Daniel. Do we believe God and His grace, Who gave us His Only Begotten Son, Who is warning us that the Rapture will take place before His wrath? And that (great) tribulation is not wrath? Or do we believe the devil infested jesuits and the catholic church with blood on their hands and falsely claiming that the Rapture will take place before “the great tribulation” that Pre-trib believers claim and God never did say? The word anti-christ is not mentioned one time in the Book of Daniel. Thus the context of Daniel 9:27 does not relate to the anti-christ , let alone that he will break the covenant with the present state of Israel. And He shall confirm the covenant with many for one week; and in the midst of the week He shall cause the sacrifice and the oblation to cease, and for the overspreading of abominations He shall make it desolate, even until the consummation, and that determined shall be poured upon the desolate. 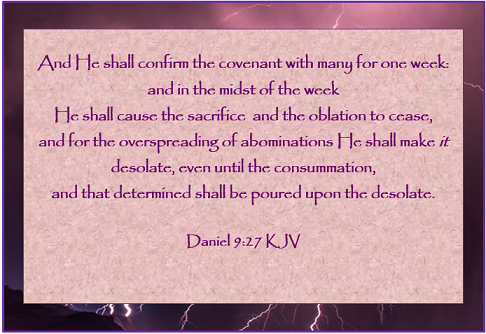 The phrase “confirm the covenant” in Daniel 9:27 relates to the Covenant God made with Abraham and with many and this Covenant is ratified by Lord Jesus when His Blood was flowing for us sinners on Golgotha. The Seventieth Week is completely fulfilled the moment Jesus Christ called out “It is finished”, that triumphant Night. And after threescore and two (62) weeks shall Messiah be cut off but not for Himself: and the people of the prince that shall destroy the city and the sanctuary; and the end thereof shall be with a flood, and unto the end of the war desolations are determined.